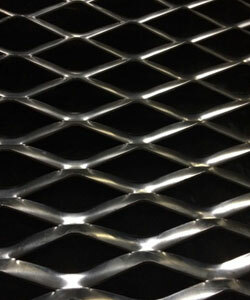 Expanded Metal is a rigid, non-raveling piece of metal that has been slit and expanded. Metal can be expanded ten times its original size and lose up to 80% of its weight, becoming stronger and more rigid in the expanding process, and no material is lost in the process. We supply a highly developed and very original expanding metal range, which has been constructed to meet the demands and cost requirements of the customer. Expanded material can be used for various things, which includes Conveyor Walkways | Braai Grids | Security | Architectural Fencing | Security Fencing | Window and Door Security, and MUCH more! This is a sheet of expanded metal, which has been slit & expanded into a network if diamond shaped meshes and supplied in various materials.